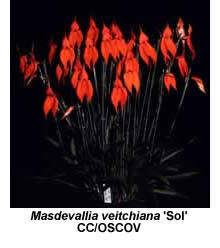 Although the Spaniards Luiz and Pavon established the American genus Masdevallia as long ago as 1777, Masdevallia veitchiana was not introduced to cultivation until 1867. Its large red flowers and vigorous growth habit make it one of the most popular species in cultivation today, at least among those orchid enthusiasts living in cool or temperate areas. Like most other masdevallia species, it needs cool, moist conditions, and is better suited to cultivation in southern Victoria and Tasmania than in the wanner northern states. Masdevallia veitchiana was first discovered near Cuzco (Peru), where it grows on rocky slopes above the tree line (usually 3300-3900 m above sea level). It grows on or between rocks among grasses and low shrubs, where its bright red flowers are clearly displayed on their long stems but the plants themselves are shaded from the direct rays of the sun. The species was first introduced to cultivation by Richard Pearce and Walter Davis, two in a long line of plant collectors employed by the famous British nursery of Veitch and Sons. H.G. Reichenbach named Masdevallia veitchiana after Sir Harry Veitch, who took over management of the family firm after the death of his father, James Veitch, in 1869. Harry Veitch was intimately involved in the nursery from the age of 18 in 1858 until his retirement in 1914. Today he is best remembered for his classic work, the Manual of Orchidaceous Plants (published in parts between 1887 and 1894), and reprinted (in two volumes) several times since.